It’s an all-too-familiar scenario. Two humans try to blend their existing packs and wind up with their dogs fighting and creating chaos. It can happen with roommates moving in together, people trying to date, or even when bringing a new dog into an existing pack. It doesn’t have to be this way and, short of having one or more dogs that are red zone cases (which will require a professional trainer’s help), you can take steps to prevent this problem before it happens or solve it if it does. One big mistake people make when introducing dogs from different packs or bringing in new dogs is by just tossing them together in one pack’s territory and hoping that they’ll get along. Maybe they will and maybe they won’t. By bringing a new dog into another pack’s territory, you are running the risk of the existing pack becoming assertive or aggressive in order to defend what is theirs. Depending on the new dog’s energy, they may become completely submissive and fearful, or they may fight back. Whether you’re bringing a new dog into the pack or moving in new humans with their existing pack, the procedure is the same, and you can find it in detail in the article A New Member of the Pack. The short version is that all of the dogs should meet in neutral territory and take a long walk together first, before coming into the home. Then, the humans enter first, followed by the dogs that live there, followed by the new dog. In this way, you are allowing the dogs to first bond as a pack on the walk, then allowing the dogs currently living in the home to bring the new dogs in. Just shoving a new dog in through the door is an invasion; doing it this way turns it into an invitation from the existing dogs. Too late — now what? One dog fight does not make for a disaster, but your reaction to it can. Even among the seemingly closest of pack mates, sometimes something can happen that will get them going at each other. One of them doesn’t respect the other’s space and a correction turns into a conflict. Maybe a human member of the pack accidentally drops a high value food item on the floor and both dogs go for it. Maybe one of your dogs is experiencing physical pain and another dog nudged her the wrong way. The first step with the first fight is to break it up quickly and calmly. Cesar explains the steps to breaking up a dog fight, where your instinct is the key. Focus on the dog with the higher level of intensity, use touch to redirect (this forces them to release if they’re biting), and then pull them up (not back). Never yell or shout excitedly when breaking up a dog fight — this will only elevate the aggression. You can use a loud grunt or shout, but always in a calm manner. You’re not breaking up the dogs with your voice; you’re defusing the aggression with your energy. The second and most important step with a dog fight is how you handle it after. The right way: forget it happened, because your dogs will. The wrong way: start worrying about the next fight, because that is the quickest way to guarantee that it will happen. It’s also very important to walk your dogs together, side-by-side. Not only does the exercise help to lower their energy, and hence the impulse to fight, but by moving your dogs forward together it focuses them on a common goal instead of each other. Remember: the worst thing you can do if you have dogs that fight is to ignore the problem by isolating them from each other. Socialization is key for a well-balanced dog. What this actually does is create a separate territory for each dog, and fighting over territory is the only natural cause of battles between dog packs. Since the dogs will still be able to smell each other, that conflict will become an obsession. If they ever do wind up together in this situation, then they will fight. Even the most seemingly balanced dog pack may occasionally have a fight in it. The important thing to remember is that you are in charge and conflict like this is not the end of the world. Break the fight up quickly and calmly, redirect the dog’s attention, take them for a walk together, and don’t worry that it’s going to happen again. They may or may not fight again, but if worry over it does not become your obsession, you will not be feeding them negative energy that will lead to another fight. Reward them when they are being calm and submissive, and correct them when they are not. 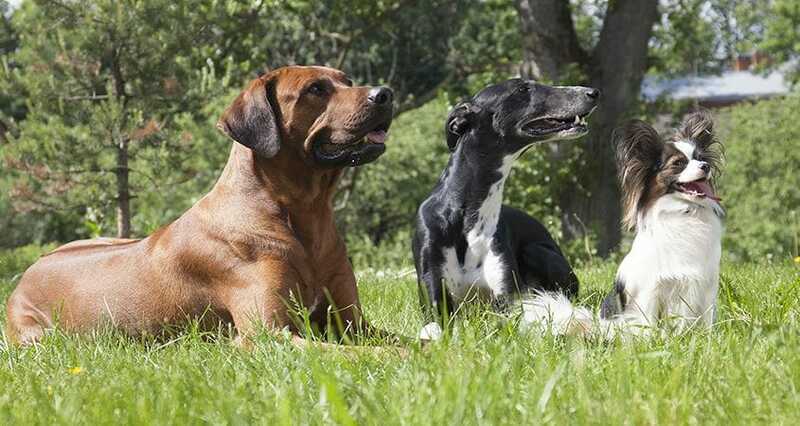 Your dogs would prefer to not fight, and you as the pack leader can help them achieve this goal. Have you had problems with fights in your pack? Let us know what worked for you in the comments below!